HÀ NỘI – Việt Nam needed to promote the development of it’s poultry industry due to rising demand for eggs and meat in the domestic and global markets. Experts made the comments at a meeting organised by the Ministry of Agriculture and Rural Development (MARD) in Hà Nội on April 12. Deputy Minister of Agriculture and Rural Development Phùng Đức Tiến said it was necessary to focus on production to meet quality standards at home and abroad. 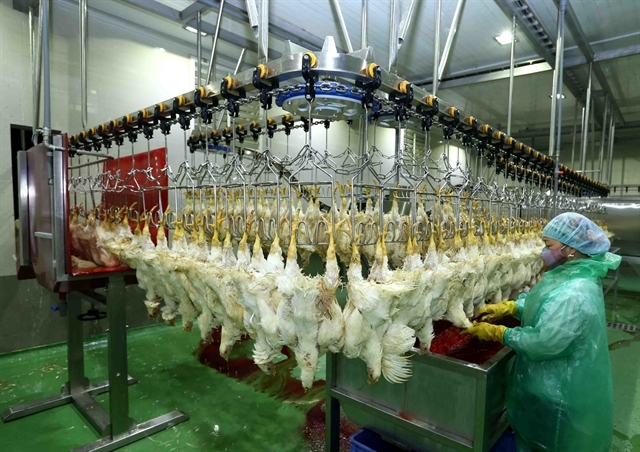 This would create favourable conditions for domestic poultry products to meet hygiene and safety standards in export markets such as Japan, Republic of Korea (RoK) and some ASEAN countries, Tiến said. It would also help local businesses expand their production scale and export to potential markets including China and the Philippines, he said. However, experts said the industry needed a strategy to increase other processed poultry products including processed chicken and duck and other products processed from eggs. They said this year, localities should draw up support policies for farmers, owners and enterprises to invest in poultry development. Deputy Head of MARD’s Animal Husbandry Department Nguyễn Văn Trọng said Việt Nam held huge potential for poultry production because of domestic high demand with a population of nearly 100 million, excluding export demand. According to Trọng, output had increased to 1 million tonnes of meat and 11 billion eggs. Current trends in consumption of animal products show that pork accounts for 65 per cent of Vietnamese meals while chicken is just 20 per cent, therefore, the domestic poultry industry needs to enhance chicken farming for domestic consumption and export. Nguyễn Quang Hiếu, deputy general director of De Heus Co, Ltd, said to boost exports, the industry should build safe areas free from disease and have mechanisms to protect livestock farms, ensuring quality standards of export markets. According to the ministry, joining international organisations as well as bilateral, multilateral and free trade agreements would help domestic poultry production meet domestic consumption and export demands. The average consumption for the average person is 89 eggs per year while the figure is 125-340 eggs in Thailand and Indonesia and 404 in Israel. In addition, the domestic confectionery and processed food industry was also developing an increasing demand for eggs. Global production in 2019 was expected to increase by 3 per cent compared to 2018 to reach 98.4 million tonnes, marking the strongest growth rate over the past five years mainly due to rising demand in China. That was a great opportunity for the nation to promote poultry meat and egg exports, according to the ministry. The poultry production industry was applying scientific and technological advances in production to improve quality of products and competitiveness.